Babak Jalali’s “Radio Dreams” takes place on a very big day for a tiny Farsi-language radio station that operates out of San Francisco. Metallica is expected to show up, at some point, and the different people in control of the station want to make sure that people tuning in beforehand hear the best version of PARS-FM possible. The director of programming, (Mohsen Namjoo's Hamid, with a mushroom cloud of grey hair) insists on segments that include grave, gorgeous poetry and features about monkeys in space. An opposing figurehead (Boshra’s Dastournezhad’s Maral) prefers advertisements and interviews with their sponsors. Both Hamid and Maral even have their own sullen keyboardists that they throw on the air for their clashing causes, which might be one of the biggest jokes in this otherwise very dry comedy. Meanwhile, a rock band named Kabul Dreams (a real one who lays claim to being “the first rock band of Afghanistan”) prepares to jam with Metallica, an act Hamid passionately says will be a uniting of Afghanistan and America post-9/11. The movie is of note for being the second by Iranian-British writer/director Babak Jalali, whose 2009 debut “Frontier Blues” is worth the hunt, especially for fans of dry comedy and precise world cinema. “Radio Dreams” creates a striking contrast with "Frontier Blues": if Jalali guided that extremely composed little story about different lives in Turkmenistan with his intellect, “Radio Dreams” is an example of both the compelling passion and polarizing fallibility that can arise when a director works primarily from the heart. “Frontier Blues” and “Radio Dreams” speak to each other in a curious way. The former ends with a man practicing English with hopes of going to a place with more opportunity; “Radio Dreams” begins with the voice of a man asking himself about America, “Am I going there to become a mute?” Words have huge value in this movie, with Jalali spending time to play out Hamid’s poetic radio segments (a story about a woman and a penguin in her backyard gets five minutes and accompanying random footage of Kabul Dreams sitting in a car), and the question of America’s opportunity is always in the air. In a too-obvious interview segment with Kabul Dreams that Jalali refers to every now and then, the band speaks about why their rock music is important, and what America signifies to them: “There are no limitations in doing something here.” There are even long takes of people talking that are filmed with characters barely captured in the corner frames. Like how the film paints a clever picture of art vs. commerce using radio programming but doesn't take any stance on it, it can be off-putting at the very least. 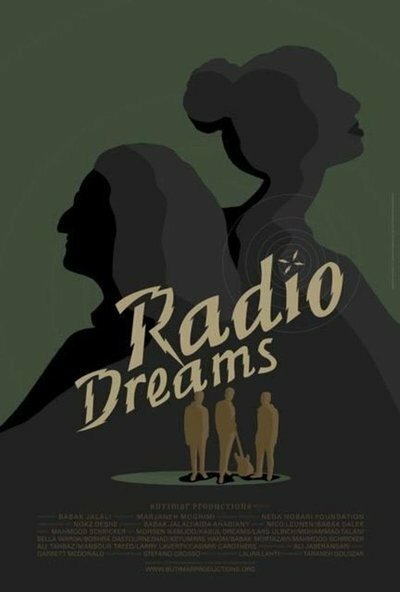 But “Radio Dreams,” as it expresses the lives of people who look for opportunity and lack thereof in America, always comes back to the importance of the characters’ words: that they are said, and that they are heard. While it can seem empty or erratic at some points, it’s best to view “Radio Dreams” as the story of the artist as director of programming for a radio station, who has a dream of using culture to unite the world. In one of the film’s more lively scenes, he talks about wanting to unite political leaders with music, with a type of festival that seems like a sad pipe dream. But with one of the most, if not the only electric performance in this droll movie, Namjoo conveys this all with equal sincerity and desperation in his voice. Working with undoubtedly his loudest character yet, Jalali cares deeply for Hamid's emotions and it leads to a few missteps: a low-fi dream sequence featuring Hamid wandering the streets of San Francisco, only to see a woman singing “Ave Maria,” is one of the film's more glaring rough draft ideas. As everyone waits for this heavy metal Godot, “Radio Dreams” gets tangled up with Jalali’s desire to capture such tediousness. It can seem even slower whenever it has viewers adjusting their expectations for a very dry workplace comedy, as it does in a few flat sequences involving blank-faced interns wrestling. And yet, Jalali is clearly not interested in narrative conflicts bigger than a lack of instruments for a jam session with Metallica, to name one strand that goes on and on with not enough tension. He continues to be an interesting filmmaker, but I think once he gets his cinematic sensibilities more in tune with his words, he could be a great one.